Are you a DC area food blogger? Then come to a fun happy hour on September 2nd to meet other food bloggers! Mary of the arugula files is one of the organizers. Leave her a comment so she'll know how many people are coming. Remember I wrote about receiving a green pepper as a gift? I must admit (and this is not pretty) that I asked why the pepper wasn't just allowed to turn red on the plant before being picked. After all, red peppers are definitely more delicious than green ones. Well, turns out the green peppers grown in one's garden and harvested have a hundred times more flavor than the green peppers I buy at the store! One of my summer favorites is an orzo salad: it's very easy to make, lasts in the refrigerator for several days and is a great way to use some of the random things you have in your refrigerator. This time I decided to use the green pepper, a huge tomato one of my coworkers gave me and fresh basil. 1. Combine cooked and cooled orzo with tomatoes, peppers, basil and red onion. Drizzle with the dressing. Mix. 2. Refrigerate the salad for at least 30 minutes. Variations: add olives, feta, sundried tomatoes, chicken or good tuna. Where do I even start? I was horrified by the prospect of making chocolate butter cream and having one of the layers covered with caramel. But I decided to go ahead and give this cake a try (because who knows if the next challenge will be even more challenging? We are allowed to only skip 2 challenges and I've already skipped one earlier this year). The Dobos Torta is a five-layer sponge cake, filled with a rich chocolate butter cream and topped with thin wedges of caramel. It was invented in 1885 by József C. Dobos, a Hungarian baker, and it rapidly became famous throughout Europe for both its extraordinary taste and its keeping properties. The recipe was a secret until Dobos retired in 1906 and gave the recipe to the Budapest Confectioners' and Gingerbread Makers' Chamber of Industry, providing that every member of the chamber can use it freely. I halved the recipe and made a mini cake. Making the sponge layers wasn't too difficult: instead of making individual round layers, I made one big layer and cut out the circles. It was definitely spongy and not too flavorful. The chocolate butter cream was pretty easy to make, but I must have made a mistake somewhere because it did not turn out as thick as I would have expected (even after chilling in the refrigerator) and it was rather hard to work with. The caramel layer (you top the top layer of the cake in caramel and then cut it into slices) was truly a pain. It stuck to the paper and was chewy to eat...I was afraid all my fillings would be pulled out. Uhm, anything else I could complain about? :) I guess I am just disappointed by both the taste and the look of the final product. I will definitely not be making this cake again. In fact, I gave most of the cake to Jenn to share with Luis and his roommates. And now for "what were they thinking? 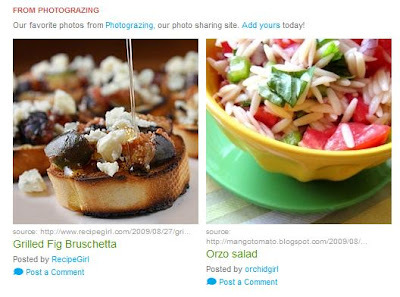 "....SeriousEats chose my cake as photo of the day! This just made me laugh (not out loud, because I'm at work). This just proves that beauty is in the eye of the beholder. In the words of my friend Jenny, toodles for now. Last Friday my friend Kenny brought me fresh vegetables from his garden: the sweetest mini cherry tomatoes, basil, parsley and a green pepper. Doesn't the photo below look like it can be turned into an oil painting and hung in a museum? Before deciding what to make with this fresh produce, I made a basil bouquet: the smell was intoxicating! As much as I was tempted to simply eat the tomatoes on their own, I decided to make a quick salad. This really doesn't require a recipe: you simply cut a few ingredients, season with pepper and drizzle with olive oil. Ingredients: cherry tomatoes (halved), olives (quartered), red onion (thinly sliced), basil (thinly sliced), olive oil, black pepper (there is no need for salt because of the olives). Doesn't this salad remind you of the toppings you could put on pizza? The only thing missing is fresh mozzarella! I don't have a recipe for you today, just a few photos of things that have made me happy. Last week I received a package in the mail with 3 different flavors of gourmet marshmallows from Plus Puffs Gourmet Marshmallows. Did you know that August 10th was National S'mores day? If you missed it, don't despair: turns out, August 30th is the Toasted Marshmallow Day! The three flavors I received are chocolate, caramel and lemon (pictured below). I had the best intentions of cooking with these marshmallows, but in the end just ate them as is and added a few to my morning coffee. Over the weekend Jenn and I went to Macy's where I randomly bought these 4 plates: LOVE them! They are perfect for taking pictures because they are not too small or too large :) Aren't the colors great? And they match my red and yellow soup bowls! You'll definitely be seeing these in the future posts. Stay tuned for Tomato/Olive/Basil salad and Daring Bakers! Despite my involvement with Daring Bakers, I'm not really a baker. Wednesday night, however, I had an excellent idea (if I say so myself). That idea, as many other ideas, came to me as I was falling asleep. I thought about a frozen meal that was defrosting in my refrigerator: part of that meal was puffed pastry, which I was supposed to use to wrap a piece of salmon. Instead, I decided, it would be fun to use that puffed pastry to make a summer dessert. 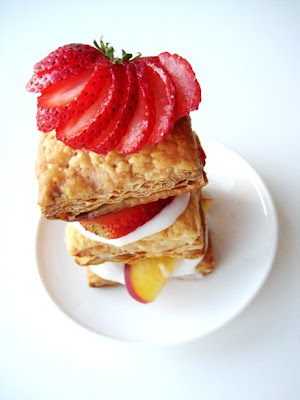 Thursday night when I came home, I made these Summer Fruit Napoleons. All you need is puffed pastry cut into squares and then baked according to the directions on the package (I made a few holes in each square with a fork to make sure the finished product would not be too puffy). 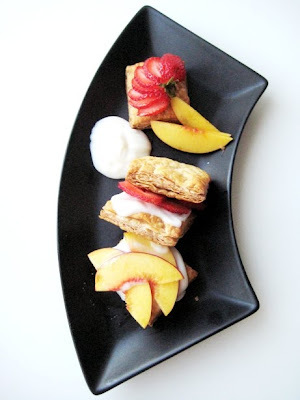 Then, I sliced a few strawberries and a nectarine and layered them with the puffed pastry and vanilla yogurt. Of course you can choose any other fruit and yogurt flavor: it's your food, do with it what you wish :) For example, I think it would be great to use Greek yogurt. 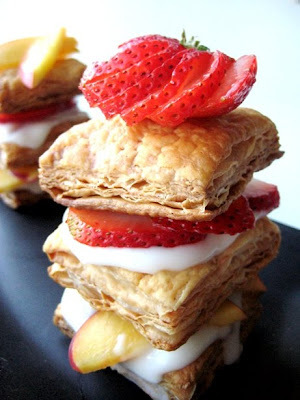 And actually, since puffed pastry is not overly sweet, you can make these Napoleons using savory flavors! This was a very simple dessert to make. I was almost as excited about taking pictures of it as eating it. Speaking of eating, it'd be pretty impossible to eat the Napoleon as is: it's just too high and unstable. The pictures below, thus, show the de-constructed Napoleon: a bit messy, but still delicious! The sweetness of the fruit was offset by the slightly tangy yogurt, and of course the puffed pastry added a superb crunch and butter taste. 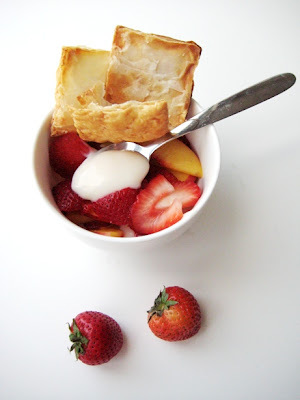 In case you just don't feel like building towers with your food, simply combine fruit and yogurt in a bowl and add a few squares of puffed pastry: I doubt anyone will say no to this fresh summery dessert. There has been a lot of buzz about Founding Farmers restaurant in Washington DC. Some of the buzz has been good, some of it has been not so good. Some people love the food, others are disappointed by it. Service seems to be a problem in this new-ish restaurant located in the International Monetary Building. And some people think the whole thing is just overrated. That's why I was so happy when Rhea invited me to her birthday dinner at Founding Farmers. Not was I only going to hang out with her and meet her two other friends, but I'd finally have a chance to judge the restaurant for myself. Let me just say that the restaurant is absolutely gorgeous. Everything from huge jars of corn and lychees to impeccably designed bathrooms, to comfortable booths and low-key and homey wooden tables. I could live in that space! We did, however, right away had a few issues with service. At first they wanted to sit us at a two person table. That wasn't going to work! Then our poor waiter, who also happened to be managing the restaurant that day, had to go back and deal with a cut in his hand. Etc, etc, etc. I started the meal with Fraise Fling--A unique blend of fresh strawberries, lychees, Snow Queen Organic Vodka, and finished with Charles de Fere Brut. Perfect on a hot summer's day! It was such a pretty drink, but did not have too much alcohol: perfect. Rhea had Nice Coat!-- A little fresh basil, a little fresh lime juice, a little Blue Coat American Dry Gin, and a little love. Nice! We decided to start with two appetizers: fried green tomatoes and cornbread. I've only had fried green tomatoes once, when I was in Atlanta (Flying Biscuit restaurant), and I wasn't too impressed. They reminded me of Granny Smith apples. What I loved about Founding Farmers' green tomatoes was the fried coating and the awesome goat cheese spread that came with them. The cornbread was amazing! It really tasted more like a souffle than your typical cornbread. And look at the adorable presentation: it comes in a little skillet! I chose not to use the honey butter that came with the cornbread, and instead used the goat cheese spread from the fried green tomatoes. Delicious! Sarah, Rhea's friend brought 4 adorable home-made mini rhubarb and peach pies and candles to celebrate Rhea's birthday. I was very surprised and happy that the restaurant did not make a huge deal about this. The pies were awesome: too bad we were missing ice cream. And that's us: Ellen, me, Rhea and Sarah. I would not be coming back to Founding Farmers for dinner any time soon, but their brunch menu does sound tempting. This is really a great and easy recipe, and with plums widely available right now, I hope you give it a try. 2) Heat olive oil and butter in a pan, add onions and cook for about 10 minutes, adding balsamic vinegar in the last two minutes. 3) Meantime, bake your pizza crust according to directions (or use store-bought prepared crust). 4) Remove the pizza from the oven and brush it with additional olive oil and top with onions, plums, Gorgonzola and pine nuts. Put pizza back into the oven and bake for about 7 minutes until the cheese has melted and the pine nuts are golden brown. 5) Let the pizza stand for a few minutes before cutting into it. I finally cooked! Yesterday was a super lazy day of just sitting at home, napping and watching a few episodes of Mad Men. I'm mad about Mad Men and have quite a bit of catching up to do (I just started with season 1). Back to the food: I did not feel like going grocery shopping in the 90+ degree heat, and so had to use what I already had on hand. I decided to make a lentil salad and add a few random vegetables that were still alive in my refrigerator. This is such a versatile and easy salad to put together. You can have it pretty much any time of the year and serve it either warm, at room temperature or cold. Special thanks to my co-worker Bill for wonderful home-grown tomatoes. They were amazing! 1) In a pot, bring lentils, salt and water to a boil. Lower the heat, cover the pot and cook for 20 minutes. 2) Immediately dress the cooked lentils with olive oil, lemon juice and vinegar. That way, the lentils will soak up all the flavors! 3) Add the chopped vegetables and basil. Adjust the seasonings and you are ready all set. Alternatively, you can let the salad cool completely before serving. What's your favorite dish to make with lentils? I feel like I haven't really done much cooking since I got back from Seattle. I just can't come up with anything I want to cook, and so I end up eating out...I know...super healthy. 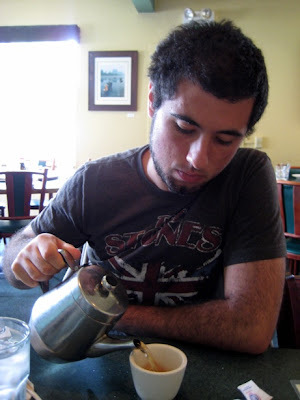 And so, I'm really happy I took a few pictures when I took my brother, Misha, to lunch in Seattle. Driving from visiting one set of grandparents to visiting our other grandma, Misha noticed Snappy Dragon restaurant and said he's been wanting to try it for a while. 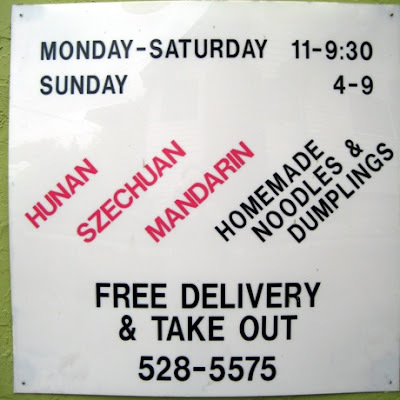 I never have to be asked twice to have Chinese, and so I agreed. 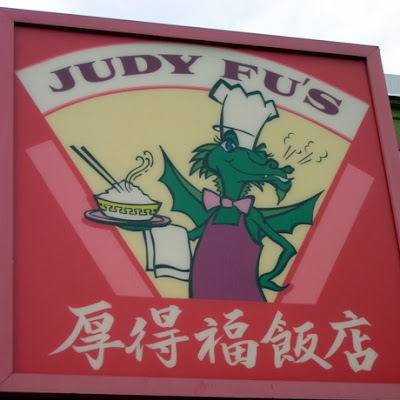 They had quite a few lunch specials, friendly service and a very low key atmosphere. And it was good to spend some time with my brother, since most of the time in Seattle I spent with my parents and Anna. 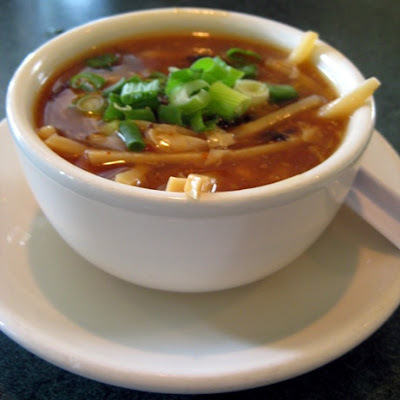 I had hot & sour soup, brown rice (Anna, are you proud of me?) 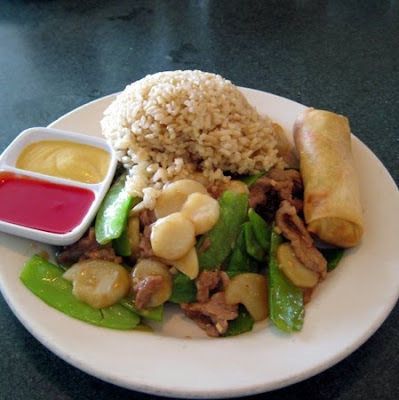 with beef and vegetables and a Spring roll. There was SO much food! We took at least half of it home. The soup was thicker than I am used to and not as spicy, but still good. I had no patience to wait for the Spring roll to cool down a bit, so I probably did not experience its true flavor...it was just too (temperature) hot. I absolutely loved all the vegetables in the beef dish! My fortune: You will receive a pleasant surprise in the mail. And you know what? The fortune came true. I received a sample of flavored gourmet marshmallows: I will write about them later. Let me just start off by saying I'm not proud of how I did in this month's Daring Cooks challenge. The choice of the dish came from my namesake, Olga, from Las Cosas de Olga and Olga’s Recipes. She chose "a delicious Spanish recipe, Rice with mushrooms, cuttlefish and artichokes by José Andrés, one of the most important Spanish Chefs at the moment." I love Jose Andres restaurants in DC (especially Zaytinya) and was looking forward to making the dish. Originally, my plan was to make this dish for my parents and siblings in Seattle, but Anna said my parents aren't big fans of saffron, so I never made the dish there. Once I was back in DC, I decided to make the dish without cuttlefish (calamari), to eliminate the aioli component and to use canned artichokes instead of the fresh ones. I also used turmeric instead of saffron (to get the same pretty yellow color without the taste) and only used 1/2 of the liquid and rice amounts, but the same vegetable amounts. Needless to say, my dish did not come out as awesome as some of the other Daring Cooks. Sigh. I'll try to do better next time. The best part of the recipe, for me, was Sofregit. I adapted the original recipe and used it as part of my Grilled Zucchini and Sofregit dish. 1. Heat oil in a large pan. Add all ingredients and cook for about an hour till they are soft. Back to the challenge...once Sofregit is ready to go, I basically sauteed mushrooms and artichoke hearts in olive oil, then added some sofregit and white wine, followed by water and vegetable broth. Once the mixture came to a boil, I added aborrio rice, turmeric and a bay leaf. The mixture boiled for 5 minutes and then cooked for 8 more minutes on a lowered heat. The canned artichokes overwhelmed the other flavors. I'm glad I only used 1 cup of dry rice instead of 2 cups. Now I have a bunch of rice left over for risotto. I'm not sure why, but ever since I've come back from Seattle, I've been insanely tired. Last night I was planning on going dancing and had to make something quick for dinner. I decided to grill some zucchini to go along with Sofregit. Note: I had this part of the recipe made a day before. It's really good either cold or hot and can be served over pasta, with eggs, or over fish. 1. Since I don't have a grill, I used my George Foreman grill. Heat the grill. 2. Meanwhile, cut off the ends from the zucchini and cut them into planks lengthwise. 3. Brush the zucchini planks with olive oil and season with salt and pepper. 4. Grill zucchini for 8 minutes using George Foreman grill. (I am not exactly sure how long it'll take on a regular grill). Ladle some of the Sofregit in a bowl and top off with grilled zucchini (I built a mini tower). If you have cheese, feel free to add some on top. Same goes for fresh herbs (I, alas, did not have any on hand). This was a very light and delicious dinner. It can also be served as an appetizer or for lunch with a piece of fish. The winner of the The Frugal Foodie Cookbook giveaway is Sala of Veggie Belly: Congratulations! Before I post a summary of the helpful hints you all came up with, I wanted to let you know that Anna (my twin) is super famous now ;) Her photo appears in Southern Living Magazine (she's the one in the blue)! *Plan your meals around what is in season, on sale, etc., then search your cookbooks or blogs for ideas on how to prepare your food for the week/month. *Do not let things go to waste! Try to keep the cupboard stocked but the fridge as clean as possible. When it is crowded, you'll inevitable miss something and it will go bad. *Keep all your vegetable scraps in the freezer and use them to make stock. Put the ends that you cut off of onions and carrots and peppers, the ends you snap off of beans, herbs that are about to go bad, and anything else that you can think of. Store them in a Ziploc bag and occasionally toss a bag full into some water with some more herbs and make a little soup stock. *FREEZE! Make twice as much of most meals and freeze left overs for later. Having a meal ready to go in the freezer leaves you less likely to stop out and grab a quick meal from fast-food or a restaurant! *Go to pick-your-own-farms - they are usually cheaper and fresher than grocery stores! *Cook beans in the crock pot--dry beans are dirt cheap, and then you can eat them for a week in all different ways. *Two words... dumpster dive! Dive at the cans of your local gourmet grocer, and get cheeses, slightly bruised fruit, breads, stuff you would never dream. Stick to the high end places and have fun! *Plan your menu for the week before you head out to the grocery store and create a plan so your food works together. For example you can pick up a few ears of corn for a BBQ chicken meal and then put aside an ear or two to cut the corn into a Mexican salad for the next day. Shoot, even the left over chicken would be good in a salad like that! Yum! *Boiled rice water makes an excellent starch for dainty collars, cuffs and baby dresses. *If you have a small amount of wine left in the bottle, freeze it in ice cube trays, put them in a freezer bag and save for when you need a small amount of wine for cooking. *Buy extra when it is on sale and freeze. Along the same vein, cook ahead and freeze dinners. *Have lots of friends with lots of fruit trees. 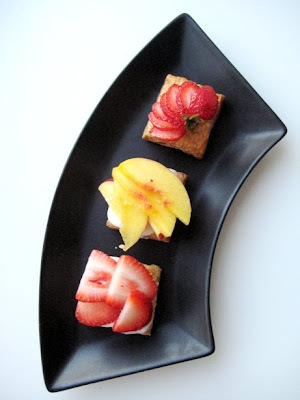 Take advantage in the fall and freeze fruit sliced up and also dehydrate for snacking year round. When I came to Seattle to visit my family, my parents' fridge was full as always. Of course my dad has made his famous borscht, there was plenty of cheese and cold cuts, my mom bought a ton of tomatoes and cherries, and they also had a package of wonton wrappers. My parents, Anna and I drove 4 hours to Ocean Shores to stay in a mini resort. Misha (my brother) stayed home. There was nothing to do at the resort but watch Cable, eat, and walk along the ocean shore. Walking on the beach doesn't rank high on my list of fun things to do, so I drove my dad crazy watching John & Kate Plus 8, Housewives of Atlanta, and a zillion Food TV shows. I also made a few jewelry projects, and did a bit of cooking. Below is a recipe for Potato and Mushroom Potstickers I made using the wonton wrappers my mom had. 1. Cook potatoes in salted water. Drain and mash. Allow them to cool. 2. Meanwhile, heat oil in a skillet. Add onions and garlic and saute till translucent. Add mushrooms and saute till everything is golden brown and caramelized (this will take quite a while, so be patient). 3. Combine potatoes with onion/garlic/mushroom mixture. Season with salt and pepper and allow to cool. 4. Put a few teaspoons of the mixture in the middle of a wonton wrapper. "Paint" the edges of the wrapper with water (I just used my finger) and fold the wrapper over in half. Crimp the edges. 5. I managed to fill 52 wrappers and still had some mixture left over. 6. This step will have to be done in a few batches (unless you have a ginormous pan): heat oil in a pan. Add potstickers in one layer. Once the bottom of the potstickers is golden brown, very carefully add about 1/4-1/3 cup of water. Cover the pan and let cook 3-5 minutes. 7. Serve with sour cream and scallions. Alternatively, you can steam or fry these potstickers. You can also freeze them for later use before the cooking process. ***I originally wrote that you can also boil them, but my mom said she boiled the leftover frozen potstickers and they completely opened up and all the filling "fell" into the water. So don't boil yours! 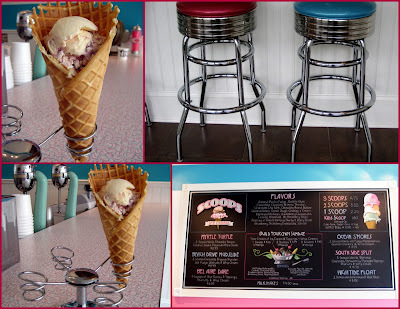 I have a few posts in the works, but here's the first one: Scoops Ice Cream! On the way from Ocean Shores, Washington to Seattle, Anna and I made a stop at a little ice cream store called Scoops somewhere in Aberdeen, Washington. You see, I'm not used to long road trips, and begged Anna to stop from time to time. This was an adorably old-fashioned ice cream parlor. I loved the red and blue colors, the old milkshake machines and the many flavors you could choose. I chose the kid-sized portion of Mt. Blackberry Revel in a waffle cone. The vanilla ice cream was rich and creamy, and the blackberries added a bit of tartness. LOVED it! Anna had a scoop of Espresso Madness: I liked my choice better. Stay tuned for potato/mushroom/onion potstickers and lunch with my brother posts. Can't wait to catch up with all of you!